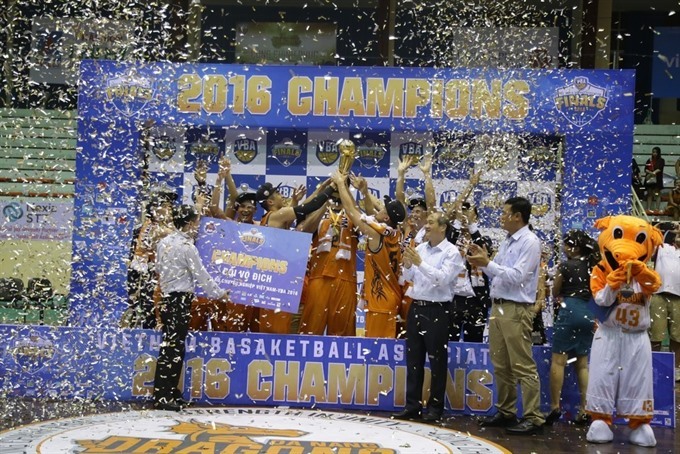 The Danang Dragons beat HCM City Wings 85-78 in the second final match to finish first at the first national professional basketball league, played at the Military Zone 5 Gymnasium in the central coastal city of Da Nang on Saturday. In the first round, the visiting HCM City Wings scored the first points. However, the Dragons quickly controlled key attackers of the Wings, such as Jaywuan Hill and Justin Young, to prevent them from scoring. With the outstanding performance of Joly Rudolphe, the Dragons took the lead with a score of 26-21. In the second round, the Wings seemed unable to find a solution to face the defenders of the Dragons. In the first four minutes, the Wings only scored four points, while the Dragons earned eight points and created a gap of 10 points (34-24). As Ngo Tuan Trung managed to stop Rudolphe’s attack, Trung was injured and had to leave the game. Without Trung, the Wings were at a disadvantage, and the Dragons continued to hold the advantage with a score of 43-39. After a break, the Wings had a change in their line-up in the third round. Newcomer Phan Minh Luyen levelled the score at 49-49 and then the Wings easily added many point, winning 62-58. The match became more strained. Both teams fought for every point, but the Dragons took the lead with a score of 85-78. In this important win, Rudolphe scored the most points, with 26. Jimmy Kien scored 23 points, Horace Nguyen had 17 points, and Nguyen Tuan Tu earned 15 points. Earlier, the Dragons beat the Wings 69-55 in the first final match. “The tournament was held very professionally and succeeded. It attracted many fans to the games. This is a good sign for Việt Nam’s basketball sport. The Dragons’ title will be an important turning point for the development of basketball in Da Nang and in the country,” said Vương Bich Thang, general director of the Viet Nam Sports Administration.